Barrrington-Leigh, C.P., and U.S. Inan, “Elves triggered by positive and negative lightning discharges”,Geophy. Res. Lett., 26, 683, 1999. Bell, T.F. V.P. Pasko, and U. S. Inan, “Runqsqyelectrons as a source of Red Sprites in the mesosphere”, Geophy.Res. Lett., 22, 2127, 1995. Franz R.C., R.J. Nemzek, and J.R. Winckler, “Television Image of a Large Upward Electrical Discharge Above aThunderstorm System,” Science249 48 1990. Fukunighi, H., Y. Takahashi, M. Kubota, K. Sakanoi, U.S. Inan, and W.A. Lyons, “Elves: Lighting-Induced Transient Luminous Events in the Lower Ionosphere,” Geophy. Res. Lett., 23 2157, 1996. Glukhov, V.S. and U.S. Inan, “particle simulation of the time-dependent interaction with the ionosphere of rapidly varying lightning EMP”, Geophys. Res. Lett.,23, 2193, 1996..
Inan, U.S., T.F. Bell, and J.V. Rodriguez, “Heating and ionization of the lower ionosphere by lightning”, Geophys. Res. Lett., 18, 705, 1991. Inan, U.S., W.A. Sampson, and Y.N. Taranenko, “Space-time structure of lower ionospheric optical flashes and ionization changes produced by lightning EMP”, Geophys. Res. Lett., 23, 133, 1996a. Inan, U.S., V.P. Pasko, and T.F. Bell, “Early/Fast VLF events as evidence of sustained heating of the ionosphere above thunderclouds”, Geophys. Res. Lett., 23, 1067, 1996b. Milikh, G. M., K. Papadopoulos, and C.L. Chang, “ On the Physics of high altitude lightning”, Geophys.Res. Lett., 22, 85, 1995. Pasko, V.P., U.S. Inan, Y.N. Taranenko, and T.F. Bell,“Heating, ionization and upward discharges in the mesopsphere due to intense quasi-electrostatic thundercloud fields”, Geophys. Res. Lett., 22, 365, 1995. Pasko, V.P., U.S. Inan, and T.F. 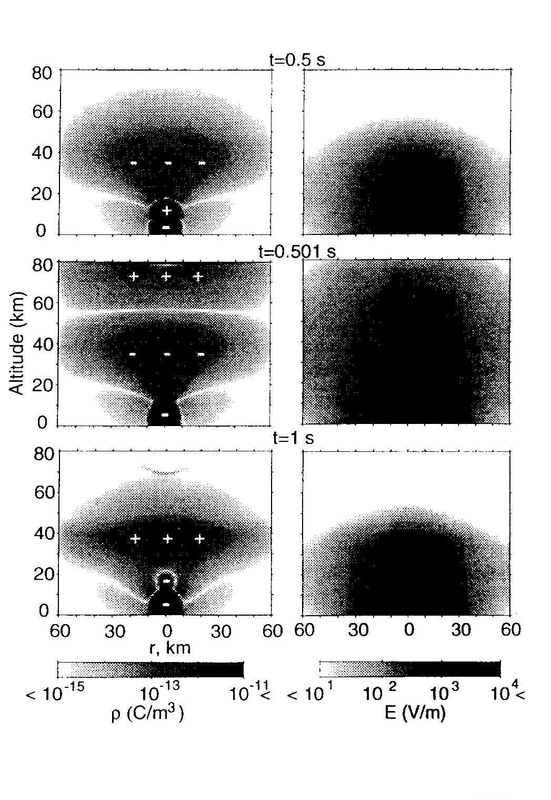 Bell, “Blue jets produced by quasi-electrostatic pre-discharge thundercloud fields”, Geophys. Res. Lett., 23, 301, 1996a. Pasko, V.P., U.S. Inan, and T.F. Bell, “Sprites as luminous columns of ionization produced by quasi-electrostatic thundercloud fields”, Geophys. Res. Lett., 23, 649, 1996b. Roussel-Dupré, and R.A. Gurevich, “On runaway breakdown and upward propagating discharges”, J.Geophys. Res., 101, 2297 1996. Rowland, P.L. and R.F. Fernsler, J.D. Huba, and P.A.Bernhart, “Lightning driven EMP in the upper atmosphere”,Geophys. Res. Lett., 22, 361, 1995. Rowland, P.L. and R.F. Fernsler, and P.A. Bernhart, “Breakdownof the neutral atmosphere in the D-region due to lightning driven electromagnetic pulse”, J. Geophys.Res., 101, 7935, 1996. Taraneko, Y.N., U.S. Inan, and T.F. Bell, “Interaction with the lower ionosphere of electromagnetic pulse from lightning: Heating, attachment, and ionization”, Geophys.Res. Lett., 20, 1539, 1993a. Taraneko, Y.N., U.S. Inan, and T.F. Bell, “Interaction with the lower ionosphere of electromagnetic pulse from lightning: Excitation of optical emissions”, Geophys. Res. Lett., 20, 2675, 1993b. Taranenko, Y.N., and R.A. Roussel-Dupré, ”High altitude discharges and gamma-ray flashes: a manifestation of runaway air breakdown”, Geophys. Res. Lett., 23, 571, 1996. Uman, M.A., “The Lightning Discharge”, Aademic, San Diego, Calif., 1987. Valdivia, J.A., G. Milikh, and K. Papadopoulos, “ Red sprites: Lightning as a fractal antenna”, Geophys. Res. Lett., 24, 3169, 1996. Yukhimuk, V., R.A. Roussel-Dupré, E.M.D. Symbalisty, “Optical characteristic of blue jets produced by runaway air breakdown, simulation results”,Geophys. Res. Lett., 25, 3289, 1998. Yukhimuk, V., R.A. Roussel-Dupré, E.M.D. Symbalisty, “On the temporal evolution of red sprites: Runaway theory versus data”, Geophys. Res. Lett., 26, 679, 1999. D. J. Boccippio, E.R. Williams, S.J. Heckman, W.A. Lyons, L.T. 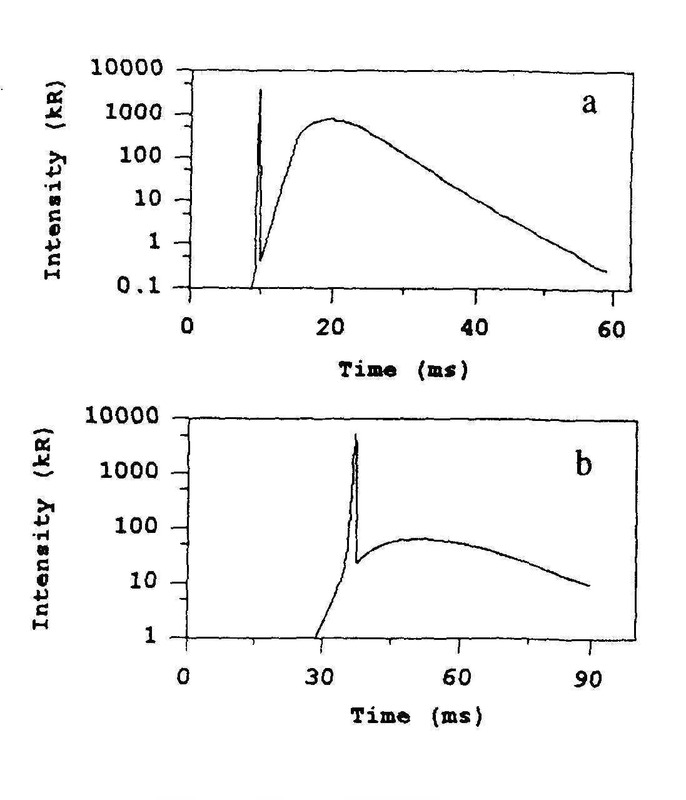 Baker, and R. Boldi, “Sprites, ELF Transients, and Positive Ground Strokes,” Science 269 1088–1091 (1995). W.L. Boeck, O.H. Vaughan Jr., R.J. Blakeslee, B. Vonnegut, M. Brook, and J.M. Kune, “Observations of lightning in the stratosphere,” Journal of Geophysical Research 100, 1465–1475 (1995) . D.L. Hampton, M.J. Heavner, E.M. Wescott, and D.D. Sentman, “Optical Spectral Characteristics of Sprites,” Geophysical Research Letters 23 89–92 (1996). U.S. Inan, C.B. Leigh, S. Hansen, V.S. Glukhov, T.F.. Bell, and R. Rainrden, “Rapid Lateral Expansion of Optical Luminosity in Lightning-Induced Ionospheric Flashes Referred to as ‘elves’, ” Geophysical Research Letters 24 583–586 (1997). W.A. Lyons, “Characteristics of Luminous Structures in the Stratosphere Above Thunderstorms as Imaged by Low-Light Video,” Geophysical Research Letters 21, 875–878 (1994) . S.B. Mende, R.L. Rairden, G.R. Swenson, and W.A. Lyons,“Sprite Spectra; N2 1 PG band identification,” Geophysical Research Letters 22 2633–2636 (1995). R.L. Rairden, and S.B. Mende ,“Time resolved Sprite Imagery,” Geophysical Research Letters 22 3465–3468 (1995). D.D. 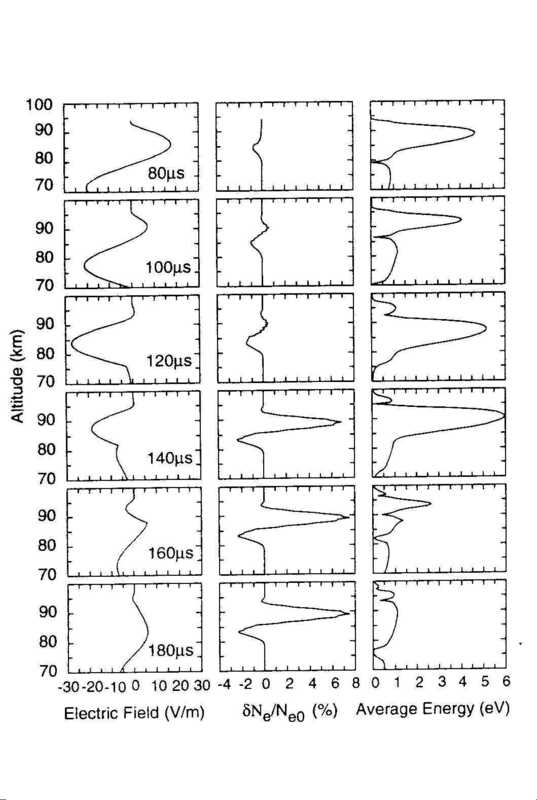 Sentman and E.M. Wescott, “Observations of Upper Atmospheric Optical Flashes Recorded from an Aircraft,” Geophysical Research Letters 20, 2857–2860 (1993) . D.D. Sentman, E.M. Wescott, D.L. Osborne, D.L. Hampton, and M.J. Heavner, “Preliminary results from the Sprites94 aircraft campaign : 1. Red sprites,” Geophysical Research Letters 22 1205–1208 (1995). O.H. Vaughan Jr., R.J. Blakeslee, W.L. Boeck, B. Vonnegut, M. Brook and J. McKune Jr., “A cloud-to-space lightning as recorded by the space shuttle payload-bay TV cameras”, Mon. Weather Rev. 120 1459-1462 (1992). J.R. Winckler, “Further observations of cloud-ionosphere electrical discharges above thunderstorms,” Journal of Geophysical Research 100, 14335–14345 (1995). J.R. Winckler, W.A. Lyons, T.E. Nelson, and R.J. Nemzek, “New high-resolution ground-based studies of sprites,” Journal of Geophysical Research 101, 6997–7004 (1996).